Some cat personalities can be a bit on the cantankerous side, and grumpy cat names can really show of your feline's frowny disposition. If you love your grumpy kitty and want a name that showcases this aspect of his or her personality, try some of these ideas as inspiration. 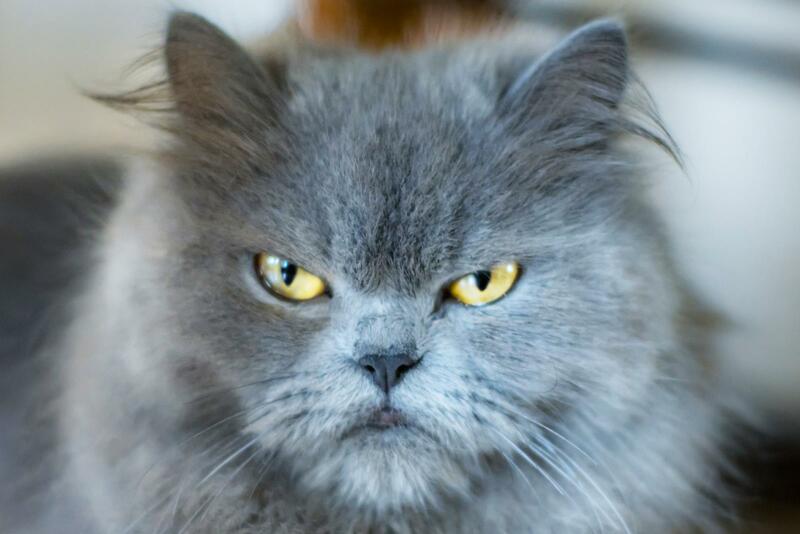 Names of famously grumpy actors, actresses and their characters from television and movies can be a fun source of names for your irritable feline. Literature is a treasure trove of ill-tempered characters with unique names that just may perfectly fit your foul-natured cat. If you love all things comics, cartoons, video games and science fiction/fantasy, consider these names of malcontent characters for your ill-tempered cat. While many people dislike cats because they find them grumpy, ailurophiles know that a cat's personality can run from friendly to cranky, and that's perfectly okay! If you enjoy the surlier side of your cat's disposition, have fun choosing a cool name that lets the world know your pet's true nature.